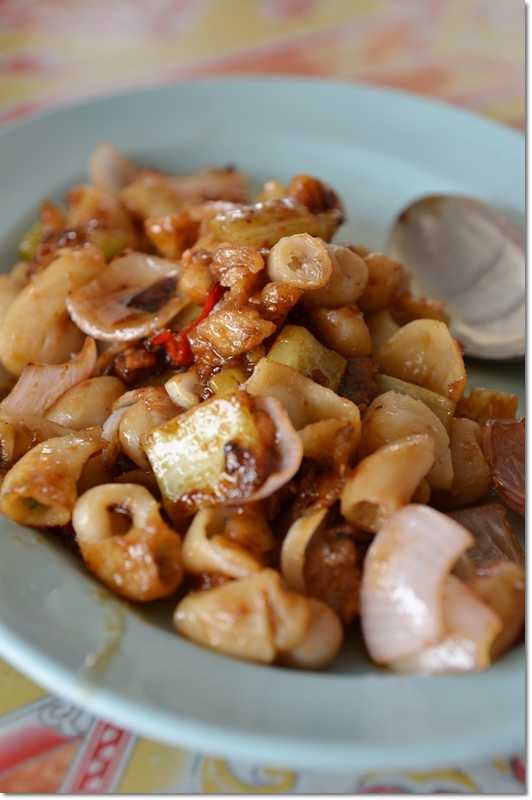 Chemor Village Restaurant @ Chemor, Perak – Stir-fried Fish Intestines, Anyone? It’s always a blessing to be around fellow foodies. Or like-minded hungry souls from my hometown of Ipoh/Perak. Not too long ago, I got this elaborate e-mail from a reader on Chemor Village Restaurant in Chemor of Perak; a town situated about 30km away from Ipoh city, and roughly 15 minutes of drive from my place. In his well-constructed piece, he was detailing about every dish so eloquently/passionately, I was immediately hooked on to his recommendation. But of course, there was that awkward moment when I started to wonder if he owns a fair share in the business itself, but this suspicion was quickly dismissed after discovering that the article was picked from Ipoh Echo’s Dec 2010 edition. And why was I feeling slightly disappointed after the meal? Read on …. To find this restaurant was no hassle at all. Coming from Ipoh’s direction on Jalan Kuala Kangsar towards Chemor/Sungai Siput, you just have to turn LEFT immediately after the Shell petrol station on your LEFT, at the traffic lights in Chemor town. 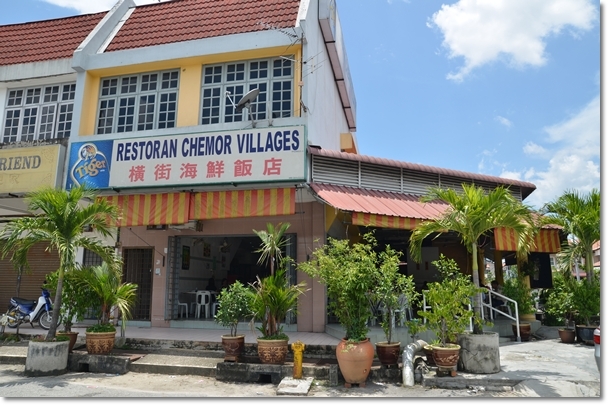 Then proceed further on the road for a short distance and you’ll see Chemor Villages Restaurant on your RIGHT. But why the dejected feeling post-meal? Not that the food there was abysmal. In fact, the dining experience was above average in our opinions. But once seated and prepared to order an onslaught of their signature dishes (like usual, this obsessed foodie of a Motormouth did his homework before the meal …), TWO of their most famous items were not available that day! One being their most popular Peppery Snakehead (Haruan, Sang Yue) Fish Soup, and the other being the Steamed Clams (Lala) in Chinese Wine. The reason being both of the supplies were met with shortage issues that whole week; rendering them incapable of whipping up their routine culinary storm, if you will. Nonetheless, the lady taking our orders was still flawlessly deft in spitting out recommended dishes …. business as usual even without the famed choices. Brilliant. Glad that the Fear Factor-worthy Stir fried Fish Intestines with Dried Shrimps was available on the menu that afternoon (phew! ), and arrived in a largely deceiving appearance. Had I told you that it was macaroni that you’re seeing, you would have believed so too. Until of course… the first bite; the acid test. Crunchy bites of well-cleaned fish intestines revealed a very bouncy texture flavoured intensely with crispy lard fritters, dried shrimps, celery and onions. I was really enjoying this, yet my dining companions were on the fence on this one. Secondly, do NOT miss their “Pao Siew Yuk” or Caramelized Roasted Pork with Spring Onion, another dish that was executed brilliantly by the nimble hands of Choong family. Usually, this dish will be met with mixed reactions; sometimes the roasted pork came off too dry with the originally crackling-crispy skin soggy from the stir-frying process. But at Chemor Village, their rendition got me hooked instantly. I tasted the crunch in several pieces of the roasted pork chopped into a mouthful bite, and the beautifully concocted sauce that was partly sweet matched the meat very well. A bit greasy towards the end; at the bottom of the dish, but hey .. this IS a sinful dish after all. The other dishes were passable as well, the cut of black pomfret was fresh and retaining that moist flesh underneath the slightly crispy exterior. The gravy was heaven-sent to go along with copious amount of white rice, and this was a very-Teochew-inspired dish with salted vegetables, tomatoes and preserved plum to create that tangy tone to the otherwise simple braised fish dish. This reminded me of Sin Hup Heng’s version of ‘Mamong’ fish steamed in an almost similar manner. 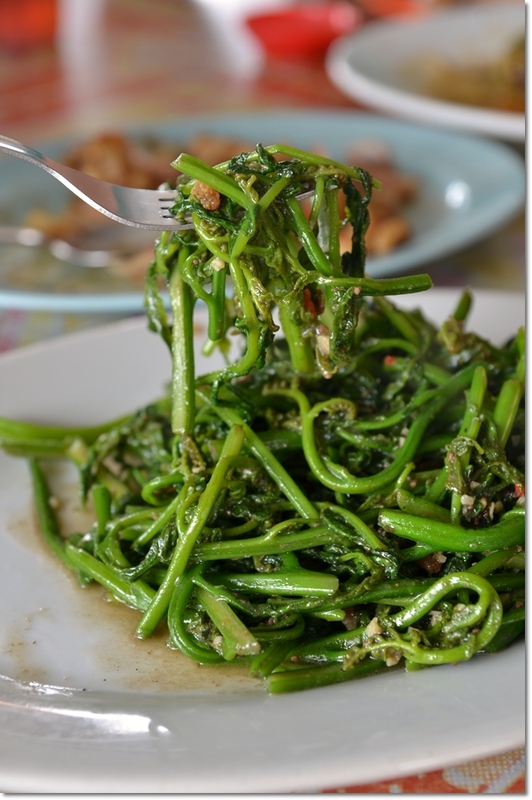 The pucuk paku (wild fern) was devoid of the sometimes prominent metallic/acerbic (‘kelat’ in Malay) taste, and was one of the better version that I have tasted in Ipoh. We initially wanted to have the lotus roots stir-fried in a preserved bean paste (‘nam yue’) sauce, but seemingly … they ran out of that too. 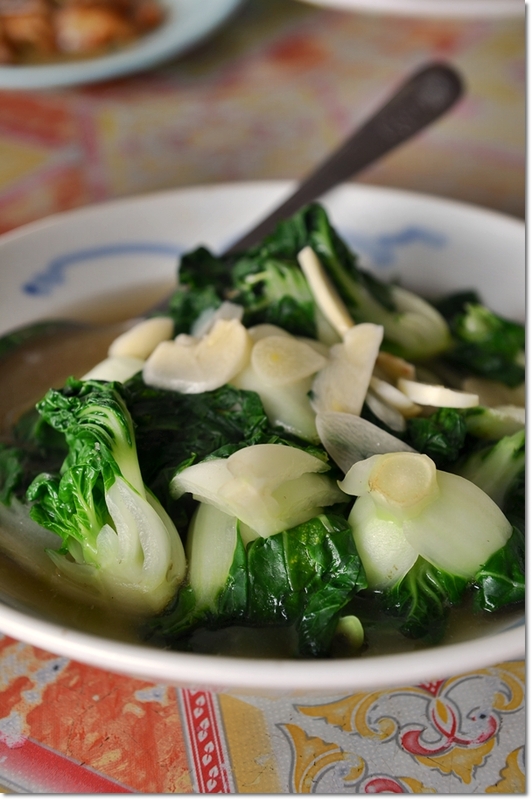 So we settled for a very simple dish of blanched ‘nai bak’ in a relatively bland superior stock. All in all, we were pleasantly satisfied with the dishes presented, yet disappointed at the inability to try their famous Snakehead Soup and Steamed Lala. There WILL be a second visit, I am sure. The question is … when? The meal came to RM78/USD26 for the four of us, including rice and Chinese tea. Business hours : 11am – 10.30pm everyday. Directions : Coming from Ipoh/Tasek/Klebang’s direction, turn LEFT at the traffic lights immediately after the Shell Station in Chemor town, which is on your LEFT as well. Then go straight for a while and you will see this restaurant on your RIGHT. Ya, I heard about fish intestine, the texture is crunchy right? Yup, crunchy. Definitely exceeded the initially expected texture! 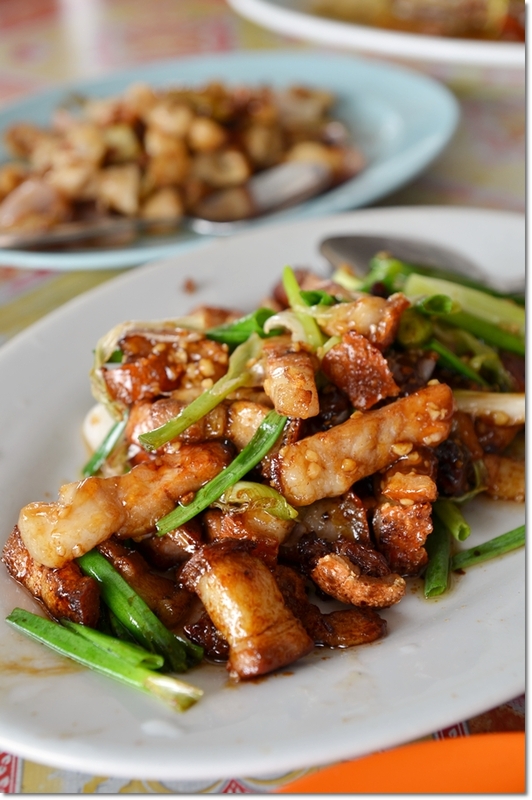 Stir-fried Fish Intestine cannot be too dry? I love wild fern shoots. i miss the peppery fish soup n another fish dish(forgot its name) there! u should go again n try it on.The siew yok is awesome, full of “wok hei”! Excellent fd they hv! Yeah, I probably just might. 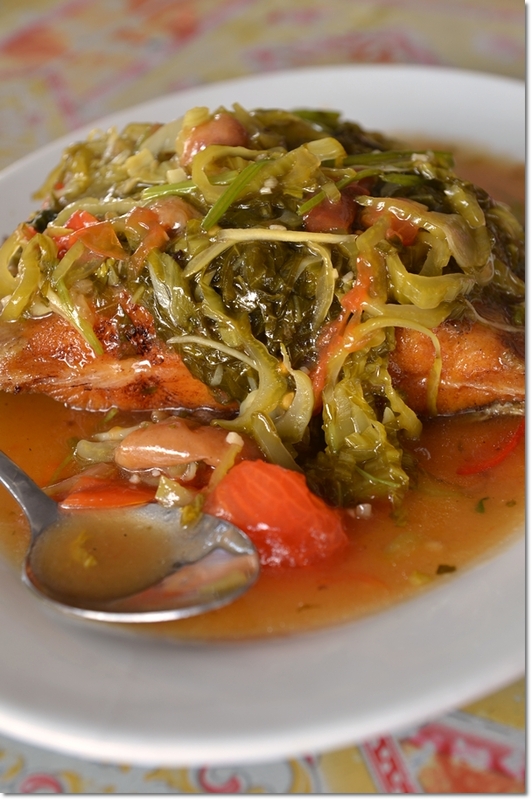 The fact that we missed the pepper fish soup and steamed lala should be reasons enough. i think off day is Tuesday. Went but is not open. Ended up eat at Woon Kee seafood restaurant nearby the main street chemor. I happen to pass by this restaurant often. I noticed they tied a dog in hot sun and during rain and the dog has to take under cover inside a drain. Such worthless, cruel people are the owners of this restaurant.